Tesco Magazine September 2015 (free instore) has a voucher for 20 Clubcard points for Maggi Noodles currently 20p on offer (free with Clubcard) and Maggi Pot Noodles currently 50p on offer (30p with Clubcard). Tesco Maggi Offer ends 29th september 2015. Tesco Magazine Voucher Expires 6th October 2015. Aren't they the same ones at Poundland? You can buy these for a 5 pack in B&M and Home Bargains for 99p. ​saving of 1p but have to buy 5 packs ?? The latest Tesco mag instore has a 20 clubcard points coupon when you buy any Maggi noodles so free noodles if you redeem the points or 60p in Deals. How are they supposed to make noodles halal? Slit the throat of some wheat husks? I like these, they are nice. I just get the chicken ones though. *pour on a bit less water than it says on the packet (using a measuring jug). *heat the noodles through on a low heat,whilst still stirring, for a few minutes to soften up the noodles and to hell absorb some of the broth. Tastes better doing thrm that way i found. The curry flavour is the best! I like these, they are nice. I just get the chicken ones though. How i … I like these, they are nice. I just get the chicken ones though. 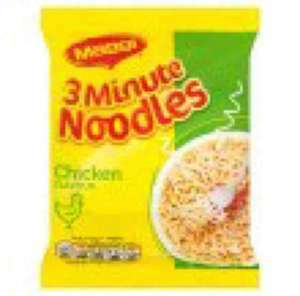 How i make them though is to:*boil a kettle*stick the noodles in a pan with the flavour powder on*pour on a bit less water than it says on the packet (using a measuring jug). *then add a glug of soy sauce and stir it in*heat the noodles through on a low heat,whilst still stirring, for a few minutes to soften up the noodles and to hell absorb some of the broth. *Stick em in a bowl and add a shake of salt. Yum 8)Tastes better doing thrm that way i found. Add the flavour sachet right at the end instead. The flavour stays on the outside and tastes stronger so you'll probably not need the salt. ​Only want 1 might be horrible has anyone tried them?
? There the same as any cheap noodle of its type. Nothing special at all. They taste exactly as you expect they would, terrible. Now supernoodles, well. Yes! Absolutely agree. They cost four times as much and they're awful. I do have the old cheapy noodles now and again but have been making my own chow mein from the egg noodles at Aldi. The calories in them are less than half of this type of noodles. Here's Khoan Vong in action doing a simple chow mein.
? There the same as any cheap noodle of its type. Nothing special at all. … ? There the same as any cheap noodle of its type. Nothing special at all. They taste exactly as you expect they would, terrible. Now supernoodles, well. Agreed. I take 1 pack of these hiking as they are light, easy to make and hot. Not much else going for them though. How are they supposed to make noodles halal? Slit the throat of some … How are they supposed to make noodles halal? Slit the throat of some wheat husks? this taste of water a wet noodle they are ****. and yes I did put the sachet in! My local poundland sells these, I've been buying the Chicken, Beef and curry flavors from mine which are sold as packs of five for £1.00. Yes , good thing i have the freedom of being able to eat what i want and enjoy my food. These ones are not made in India. Don't buy them though, but wondered why they were still being sold given all the press. I saw 5packs in Home Bargains today for 99p if that helps anyone. Also likely we will see these reduced in other places too. They have been £1 for 5 in Asda for as long as I can remember. Love the BBQ ones. Read above; these are not made in India! You don't seem to understand where Maggi Noodles sold in the UK come from! Nestlé’s Indian arm exports Maggi noodles to the U.S., U.K., Canada and Si … Nestlé’s Indian arm exports Maggi noodles to the U.S., U.K., Canada and Singapore, among other countries. Noodles exported to these countries and those sold in India are produced in the same facilities. Yeah these things would go down like a lead noodle.